Cuker has been named an Official Honoree in the 22nd Annual Webby Awards for its work on the Little Giraffe responsive eCommerce website. 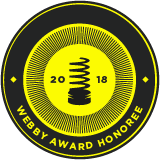 With more than 13,000 entries received from all 50 states and 70 countries this year, the 22nd Annual Webby Awards has been the most competitive season yet. As an Honoree in the 22nd Annual Webby Awards, Cuker's work ranks in the top 18% of all work entered from around the world, as judged by the Academy. Cuker completed a responsive redesign of Little Giraffe’s website in order to optimize mobile conversions and drive cross-channel sell-through for this luxury baby brand. Learn more about Cuker's work for Little Giraffe here. About The Webby Awards The Webby Awards is the leading international award honoring excellence on the Internet, including Websites, Advertising & Media, Online Film & Video, Mobile Sites & Apps, and Social. The Webby Awards is presented by the International Academy of Digital Arts and Sciences (IADAS).